When communism was taking over in Asia, the United States did everything in their power to stop Laos from becoming a communist country. Therefore, the United States decided to train the Royal Lao Army of Laos in order to combat the spread of communism and North Vietnam’s attempt to take over Laos. After the Geneva Accord of 1962, all forces were pulled out of Laos; including the USA. But when the NVA violated this agreement, the Hmong people were pulled into battle. 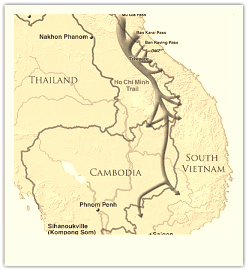 The Ho Chi Minh Trail was one of the main reason why the Hmong people were fighting in the Vietnam War. This Trail violated the Geneva Accord because North Vietnamese soldiers used this trail as a supply route and a route to invade South Vietnam. The Geneva Accord stated that there should not be any military involvement in Laos nor should there be any foreign forces in any forms in Laos.